No matter what time of year it is that you’re reading this, i’m sure you can think back to a time where there was a goal you set and you didn’t accomplish it. Did you ever take the time to really sit down and think about WHY it didn’t get done? You know, actually analyze what went wrong so you can either try again and get it right, or just look back to have that knowledge on what didn’t work so it doesn’t interfere with your future goals? While I totally understand not wanting to look back on things we’re not proud of because they “make us feel bad” the only way to learn and get better is by reviewing what went wrong. And also, reviewing what went RIGHT! When a goal does get accomplished you should look back at the process and action steps you took to make it happen so that you know how to repeat it! So now that you know why you should review your goals, I want to give you a quick exercise you can do at the end of every month, quarter, and year, to review both the goals you accomplished and the ones you didn’t. Write down all the goals you wanted to accomplish in the amount of time you’re reviewing. So if you’re reviewing one month write down all the goals you set that month, if you’re reviewing a quarter – write down all the goals you set for the quarter, etc. Can’t remember what your goals were? Well hopefully you wrote them down somewhere, look back into your planner, your PowerSheets, your Trello Board or Asana list. Now let’s get started on the review process, open up a google doc, your notebook, or download the free worksheet I already created for you here. This exercise consist of 4 questions broken down into two separate categories. Is there any way you could’ve made this better?/How could you have changed this? Here’s an example of the exercise in action! How could you have changed this? Is there anyway you could’ve made this better? As you can see, by just taking a few minutes or maybe just an hour to go through this review process for all of your goals, you can have major clarity on the plan that should have been created and the action steps that should’ve been taken to reach your goals. So now that you have this information, now what? USE IT! Look at what did happen, what didn’t, and what could’ve been done better and actually map out your plan to make these goals happen this time around. Write down what has to be done, when it has to get done, and how it will get done, in your project manager (like Asana or Trello) or at least in your calendar! This way you’re building into your time everything you need to do to accomplish your goals. While The above exercise is great it’s reactive, you’re only doing it after you did/didn’t accomplish your goals. What if you want to be proactive, and create a strong plan that will prevent any possible pitfalls before it’s too late? Well then, use this same exercise, but this time do it when you’re setting the goals you want to accomplish. Pretend as if you’re in the future and all of the goals you wanted to accomplish, didn’t happen. Why didn’t they happen? When you pre-think about a goal in this way you’ll be able to create a well thought out plan that has already thought of the possible pitfalls and built in action steps to avoid them beforehand. This way you’re making time in advance to get it done! 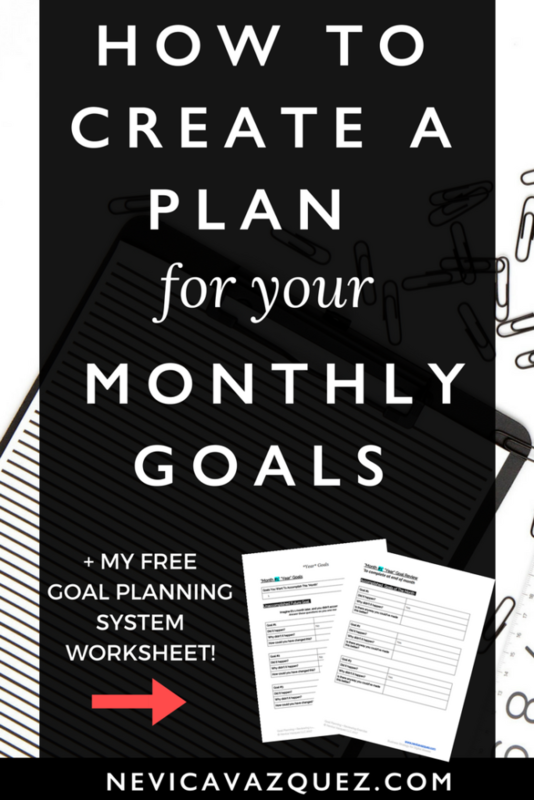 Every month continue the same process keeping all of your goals in one document so that you can do quarterly and yearly reviews to see how successful you were! Now go out there and crush your big goals! I am excited to try this. My goals are written on a zillion postits and papers lol. Thank you! I hope it helps! It helps me when I write them out this way! Please let me know how writing out your goals this way works for you!